These are direct links to blog posts about my travels to Costa Rica. Click the link to expand or collapse each entry. We are in Costa Rica. First time we have taken a real non-family FUN vacation, just the 2 of us, in way too long. It has been a very long day, Our flight was at 5:30 this morning, so we got up at 3:00 am. Quick final pack the very last things, fix a quick breakfast, then off to the airport. Happily, everything went well and we had time for breakfast in Atlanta during our 3 hour layover. The flight to San Jose went smoothly, our flight attendant was funny and capable. Although they ran out of sandwiches before they got to us so we had only snacks on the 3.5 hour flight. Once in San Jose, we went though immigration and customs with only minor confusion, and found the driver for our shuttle to the Tabacon Resort where we are staying. This was – you guessed it! – another 3 hour leg of our journey. By now we were very tired and hungry. So it was delightful to be greeted with fresh juice and moist towels at the registration desk. We had a snack while we waited for our room to be ready, then changed and went to the Tabacon Spa (free since we are staying at the resort) and swam in the hot mineral water. It is a fantastic spa. The water comes right out of the volcano and is lovely. No sulphur like so many hot springs. My skin feels wonderful now. Then back to the hotel to change and go for dinner. Now we are watching TV in Spanish (no, we do not speak Spanish) and getting ready to go to sleep. By body clock time it is 11pm, here in CR it is 2 hours earlier. Tomorrow: the canopy tour and zipline adventure! Today started out with breakfast at the hotel. I need to say that this is the first time I have ever stayed at a 5-star hotel, and it is spoiling me. It was a wonderful buffet. Amusingly, they tried to tell us the coffee they serve would be the best we had ever tasted. Not even close, even though it was served in a french press. Then it was up the slope of Arenal Volcano for the canopy tour and zip line down. It was so gorgeous taking the tram up through the forest canopy. We were hoping to see monkeys – heard some but didn’t see any. Next there were two little practice lines down. You had to decide after them if you were going to take the zip line all the way down, or not. There was no backing down after that point! It was a little scary, but no way were either of us backing down. Woo-hoo!! It was over WAAYYYY too soon. After lunch, we just hung out until it was time to go to the Spa for my reflexology massage. Aaaaaaah. Outdoors in a secluded little bamboo pavilion, with the sound of hot springs water gurgling past, and lovely flute music. I need to find someone in Columbia who does Shiatsu. Then yes, a lovely Asian buffet dinner at the restaurant in the Spa, followed by an evening dip in the hot springs. I could get used to this. Tomorrow: heading to San Jose. We have arrived in San Jose. Definitely a big city and light-years away from the lovely volcano upcountry we just left. Our hotel, the Hotel Presidente, is right on the pedestrian mall that leads to the Central Market. Tourists, predators, drunks, panhandlers, people going about their business, street vendors, young skinny people of all genders in tight jeans and urban hairdos all out there strolling along.We walked up and down most of it but did not explore the Central Market. We’ll leave that for another day when we are fresh. Our room is very nice, tile floors & a decor with a Spanish feel to it. It’s a suite and Mick has already arranged the living room furniture to his liking, since we wil be here for a week. Surprisingly, it does not have a coffee maker and they cannot provide one for us. That means Mick will be bringing our coffee gear to the hotel restaurant in the morning and making our coffee at the table.All he needs is hot water. We were also surprised by the lack of real restaurants on the ped mall. Plenty of unpleasantly familiar fast-food: Quiznos, Subway, Pizza Hut, Wendy’s, McDonalds, etc etc. Yuck. There is a restaurant in our hotel, of course, and one across the street. The “concierge” did not have a list of nearby restaurants for us. We ate across the street tonight and were not impressed. Breakfasts at the hotel are included with our room so that is good. The hotel clerk was able to steer us to a grocery store, where we bought some spring water. It’s only a couple of blocks away so very convenient. The name of the store is MasXmenos, but guess what company is on their name tags? WalMart. That’s right. Destroying local economies around the world. PLUS there’s a hotel gym which is really nice. The elliptical trainer it has is good because the foot pedals are close enough together. Some are too far apart for my gait and they hurt my knees. This one is good, YAY!!! It also has a large exercise ball & mats so I can do some Pilates. Aaaaah. Tomorrow we are getting a private tour of the city. We are making a list of things we want to locate near our hotel so we can feel more oriented about where we are. After I wrote last night’s post, we had the Trumpeter. An old man, possibly blind, and definitely in a wheel chair, parked himself right outside our window and proceeded to regale the street with trumpet playing – VERY loud – and singing. With the windows closed, we could not hear the singing, but we sure as heck could hear that trumpet. Despite several calls to the front desk, no one did anything about it and he was out there playing until midnight. I managed to get to sleep before then but Mick did not. This morning we had breakfast at our hotel, and yes, Mick took his Melitta filter cone & filters and we got a carafe of hot water and made coffee at the table. We know now to ask for the grande carafe which holds several cups of hot water.Then it was off for our city tour. It was a private tour, just the two of us with our guide Christian and driver William in a tour bus big enough for at least 20 people. We got to see several different areas of San Jose and learned more about the history of Costa Rica. For example, they got rid of the army in 1948, after a civil war over a corrupt election when the old president (who lost) didn’t want to step down. The people prevailed, and since the army had essentially been used as a tool against the Costa Rican people, they eliminated it. Since then the money has been used instead to support education, health care, and other services for the benefit of the people. Pretty cool. At the end of the tour, we were delivered to a shop where we learned about lost wax casting and how it is still done today, and had the opportunity to shop.After we got back to our hotel, the management flagged Mick down in the lobby and offered to move us so we would not be subjected to the trumpet music again. Apparently it is not uncommon for musicians to play like that in the street at night. Our new room is very nice – an upgrade, with a jacuzzi tub next to the shower. And it’s on the other side of the hotel from where we were. Our new view is lovely – across San Jose to the mountains beyond.So after we moved, Mick went out to explore some more and I went to the hotel gym. Heaven! I really needed that workout. We got back to the room at about the same time, and he jacuzzied while I showered. Then it was off to dinner. Our guide from the morning had recommended a restaurant called Nuestra Tierra, just a few blocks from the hotel. When he handed us our menus, the waiter directed us to the pages with their specialties. What a surprise, these meals were all twice as expensive as the others on the previous pages he had skipped right over. We asked for water “con limon” without thinking to specify tap water as opposed to bottled, and the waiter didn’t ask. He just brought us two bottles of Fiji water, at about $4.60 each. As we were looking at the “Other Meals” section (the cheaper meals at about $13 each), he tried to tell us those were appetizers. We insisted on ordering from that section anyway, and surprise! they were plenty of food. Actual full meals, and quite delicious. He was not very happy, and pretty much ignored us until we flagged him down so we could order dessert. Tres Leches, which we really liked. It was different than the Puerto Rican kind we have had before.However, when he brought us the limons with our water, some of the slices were orange and tasted just like lemons! I had given up on being able to get lemon-flavored citrus (you always get limes), so I was thrilled. When I asked him, he told me they are “Mandarin limons”. Who knew?? They look just like other limes on the outside. So on the way back to the hotel we stopped at Walmart (yes, masXmenos) and sure enough, they had several kinds of limons, including Mandarin limons. So I bought a little bag of them for less than $2. I am SET now.Tomorrow, we have no set plans. I expect we will go to the Central Market, and who knows where else?! We walked a lot today. There are several outdoor pedestrian malls, and we slathered on sunscreen and walked a bunch of them. We also went to the Central Market, which was wonderful and amazing and had foods I have never seen before. It reminded me of Pike Place Market in that many local people shop there for produce, meat, fish, etc. There were pet stores that also sold chickens and other “working” birds as well as more normal pets. No cats or kittens, though. There are also great walk/don’t walk signs that show the little guy actually moving, and as it gets closer to the yellow light he starts going faster & faster. I have to get some video of that – it’s great. One of the stores we went to was the 7th Street Book Store, and the owner gave us some recommendations for dinner. One place closes early on Monday, so we went by there just to look at the menu. Mmmmm. We’ll go back tomorrow for dinner when they are open later. They also had a great boutique with beautiful handmade jewelry, bags, and artwork, as well as fun T-shirts. So a little shopping as well as dinner. Where we ended up was an Asian restaurant called Tin Jo, which was fantastic and moderately priced. I had Chicken with Tamarind and Lemongrass, Mick had Teriyaki beef. Both came with lovely vegetables, most of which were recognizable. We are both thinking that we could go back there again before we leave SJ. Tomorrow we tour the Orosi Valley, east of San Jose. It is supposed to be very, very beautiful and we are looking forward to it. Today we went east. We were in a tour van with 2 other couples, our driver Emilio, and our guide Max. The first exciting thing happened even before we left town: a train merged into traffic on rails that ran down the right lane of the street. We were driving right next to it! The first city we went through after leaving San Jose was Cartago, which seems very nice. You definitely do NOT want to live in Cartago and work in SJ, because the commuter traffic is awful. We’ve been told they are working on rail to connect the cities and ease the traffic, but it is not in place yet. From there we headed up the side of Irazu, lazy switchbacks that offered gorgeous views of the valley below & slopes around us. Many brightly painted houses, crops laid out in interesting geometry, cows and horses grazing right by the road. The volcano top was cloudy, and right after we arrived the wind picked up and it started raining. We were at 11,000 feet, and it was COLD. Mick and I walked out and took pictures of the two craters we could see from there, and then hustled back to the cafe/gift shop to warm up & dry out. We had a fair amount of time to kill, and there were some interesting things to look at. The best was the sculpture of a toucan made out of an old tire. Then the sun came out, and a coati came out with it and started wandering around the parking lot! Even though there are signs saying “No Alimentar a Los Animales”, clearly this coati had learned that people=food and was quite openly begging. They are cousins to the raccoon, and equally endearing. By the time we left, the weather had cleared up quite a bit and we took a little detour to see the other volcano, which is closed to tourists due to being active. We got some great pictures. Our next stop was back in Cartago at the Basilica de Los Angeles, which is the largest church in Costa Rica. It was gorgeous inside, but there was a funeral mass going on so we just walked in enough to see but not intrude. Then we were off to Lankester Gardens, which used to be a coffee plantation but was donated as a park by Mr. Lankester. It has an orchid house, a second-growth rainforest, a cactus garden, and a Japanese garden in addition to lovely open grounds. The Japanese garden was lovely and tranquil, and had some of the tallest bamboo I have ever seen. In the second-growth rainforest, Max showed us a tree that lives in symbiosis with ants. They live inside the tree, and it produces a jelly-like food for them. In return, if anything (like monkeys) tries to eat the tree or its leaves, the ants come rushing out and and bite the attacker. He pounded on the trunk for us so we could see the ants come swarming down the trunk. Our last stop before lunch was the ruin of the oldest church in Costa Rica. What was left of the walls was beautiful against the green foliage of the trees around it. Lunch was at La Casona del Cafetal Restaurant, located on a working coffee plantation in the Orosi Valley. On the way there, we learned a very interesting thing about chayote, or water squash. This is a major crop in the Orosi Valley, and guess why? They are bought by McDonald’s, which chops them up and puts them in their “apple” pies. Chayote is a lot cheaper than apples, and apple flavoring takes care of the rest. Evil bastards. Our lunch was fantastic, on the lovely and tranquil grounds of La Casona. The patio where we ate was surrounded by flowers, and right next to a lake which sadly is becoming choked with water lilies. They are an invasive species here and are causing many problems. Then it was back to San Jose. We hung out in the room for a while, then went to a restaurant called Kalu for dinner. This is a very neat place with an interesting menu, and they surprised us with a discount coupon for the boutique. So I was able to get the bag I wanted for even less. The great thing about the shop is that they sell locally made goods, and most of them benefit the community in some way. For example, the bag I bought was made from fabric remnants by people working in a small cottage industry in a depressed neighborhood. Tomorrow is another free day, and we are not sure what we are doing. Along with other clothes, DVDs, toys, whistles, and much, much more. This guy was just starting to set up on Central Avenue when we walked by. There is like a changing of the guard around 7:30 pm – the vendors who have been there all day pack up and the evening vendors move in. This morning we went to the National Museum, which is located in what used to be a fort. It’s just a few blocks from our hotel. There was a lot of information about the civil war in 1948 which led to the abolition of the army, and you can tour the officers quarters. There was a lot of European influence there, right down to the Art Deco bedroom decor. There was also a lot of information about the indigenous peoples and how they evolved, right up to the point where the Spanish arrived. After we got back to the hotel, Mick did some hand laundry because it’s VERY expensive to have the hotel do laundry for you. $4 for one T-shirt! So the room is festooned with drying shirts & socks. Guess he could have just bought some, couldn’t he?? And really, that was about it for today. Pretty low-key all around. Tomorrow we are taking a tour of a coffee plantation, Cafe Britt. Today we had a tour at Cafe Britt. I have to correct what I said yesterday, it is NOT a working plantation, it is a roasting company. 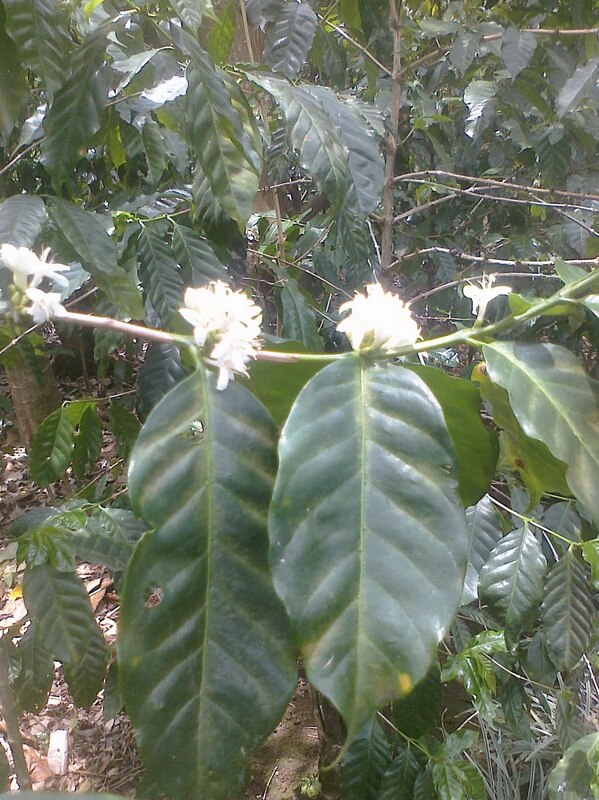 They buy from small estates all over Costa Rica, but only good quality Arabica that is either organic or shade grown. Unfortunately, many small farmers that don’t use chemicals cannot afford the certification to label themselves “organic” as it is quite expensive. Interestingly, “shade grown” can mean either shaded by tall trees or shaded because it is in the cloud forest. Either way, that’s how these farmers combat the #1 enemy of coffee, which is fungus.The other problem they face is a borer worm, and they use wasps from Guatemala which parasitize & kill the borers quite successfully. We saw plants in various stages of bloom/cherry and learned about the growing cycle. It takes 3 years for a coffee plant to start producing, but then it will bear fruit for 25 years or so. I was surprised to learn that a single plant can be in multiple stages at once – flowers & small berries, and green berries & berries ready to harvest. That’s why coffee is harvested by hand, so that only the ripe cherries are picked & the green ones are left to mature. We saw their roasting plant, and took a trip to an unused wet processing plant to see the equipment that is used to get to the coffee bean. Lunch was included and the timing was perfect, as it started pouring just as we sat down to eat. The final part of our tour was a demonstration by a barista on how to use various methods to make coffee, espresso, and frothed milk. I did not know you could use a french press to froth milk! It was still raining when we got back to San Jose, so I went to the gym and Mick went in search of coffee filters. For some reason, you cannot find the little cone-shaped filters anywhere, and we are almost out. For dinner, we went back to Kalu, which has the boutique where I bought the bag last time. Our meal was delicious. Then the gentleman next to us struck up a conversation, and it turns out his family has a coffee farm in the Orosi valley. So we chatted about coffee and he told us more about how the small farms work. Tomorrow is our last day in San Jose. We will do some shopping now that we have scoped out the best prices for t-shirts and a few other things. Today started out as pretty mundane, but did not stay that way! As planned, after breakfast we went out to do some shopping. I bought two t-shirts, or camisetas as they are called in Spanish. I also finally videoed one of the cross-walk signals that I have enjoyed so much. Lunch was Middle Eastern food at a little food court across from our hotel – it was quite good. In the afternoon, I felt like relaxing, so I read while Mick went out to find the AutoMercado to buy coffee filters. Not long after he returned, there was an earthquake! The hotel shook a lot for about 10 seconds, and didn’t really stop until after about 30 seconds. I checked some of the local twitter accounts I’m now following, and sure enough there was a link to the USGS site that told the strength and epicenter. It was a 6.0 that happened about 16 miles (25 km) away. Fortunately, there were no aftershocks that we could detect, and no apparent damage here in SJ. For dinner, we went to a Venezuelan restaurant. The thing I love about Central and South American food is that they take such simple ingredients and give them wonderful flavor. It’s been a long time since I had so much healthy and delicious food other than what I cook myself. After eating, we strolled over to the Avenida Central, which is the pedestrian mall I have mentioned before. At the square by the Theatre Nacional, a man was playing guitar quite beautifully, and we stopped to listen for a while. It was so pleasant, with the music and all the people walking around, I just videoed some of it to share with you. It’s been a long time since I watched the sun set as I waded in the surf.The ocean is warm here at Tamarindo, and the sand is brown and black. It made lovely patterns in the ebbing tide. This was a sweet way to start the evening of a very long day. We set the alarm this morning so we’d be sure to be up, packed, & have time for breakfast before the shuttle came to pick us up at 7:40 am. He was actually a few minutes early, so we were glad that we were down in the lobby, checked out & ready to go when he showed up. The van had a few more pickups, including 4 people in Heredia. We were full as we headed west. At the 3-hour mark, we stopped at an exchange place, where the Interbus vans swap passengers. There were macaws and howler monkeys hanging out in the trees, and peacocks, a deer, and a toucan in a fenced enclosure. I never did get the story about the menagerie. Mick & I along with three other passengers from our van switched to a new van that brought us on into Tamarindo. By the time we got to the hotel we were tired and starving, so it was a big disappointment to discover a big pool of water in the closet of our room. BUT we packed back up & they moved us to another room. After we got some food in us we felt much better, just in time to enjoy the sunset. It’s fun to see there is indoor wildlife here like we remember from Maui – geckos on the ceiling, large flying insects. There were even cute little bats swooping around just at dusk in the empty part of the restaurant, grabbing up bugs. After relaxing for a while, we walked up the street and had a light dinner, then walked around a bit more. All the shops were closed, so we just scoped out what’s nearby. We’re not sure what will be open tomorrow either, so it may be a quiet day of sun, sand, ocean, and reading. Low key today. Woke up around 7:30, had breakfast, strolled around to see what was open & checked out the various stores. It never ceases to amaze me that two stores will have the same merchandise for wildly different prices. There was a skirt I found that I liked – one store had it for $33, and two blocks down I found the exact same skirt for $20. Guess which one I got? Also a great t-shirt with koi on it, and some sandals.There was a cat hanging out at the open-air cafe where we had lunch, friendly but really more interested in whatever food she could coax from the diners. After lunch we walked around a little more, then it was back to the hotel. We went swimming in the ocean and the hotel , then just relaxed on the lounge chairs by the pool for a while. We decided to walk down to a restaurant called FTs for dinner, another open-air place. When we got there, they had the Sharks/Canucks game on! Unfortunately, we sat at a table right underneath a light, and were bombarded by little black beetles during our whole meal. Yuck. Tomorrow, I might go to a Pilates class, it depends in part on how much it costs. The schedule was on the door of the studio but not the price. It’s nearly over. Tomorrow we fly home. But today…well, today we are still in CR, and it was a gorgeous day. Sunny with a wonderful breeze. Normal breakfast at the hotel, and fun conversation with another couple that we met who live in San Jose, CA, which of course is Mick’s home town. After relaxing on the patio for a while, we walked to the Yoga/Pilates studio down the street, and I took the 11:00 Pilates class. It was supposed to be 75 minutes long, but actually lasted an hour and a half. The teacher taught the class almost entirely in Spanish, but I was able to get most of it because I’m so familiar with Pilates. I actually understood more of it than I expected to because of that. She cued me in English when I needed it. 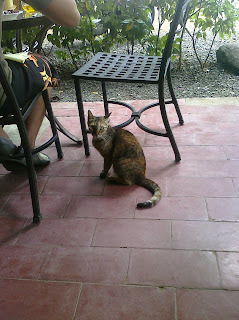 For lunch, we went back to the same place as yesterday – fish tacos and a fruit sandwich, as well as la gata daintily begging. It was just as delicious today. The rest of the afternoon was devoted to the lounge chairs by the beach – sun (yes with lots of sunscreen), reading, swimming in the ocean. There was just enough surf to make for fun in the waves. Then a dip in the pool to get the salt off, and a few more minutes in the sun to dry off. When it was time for more food, we decided to try a BBQ place near the Pilates studio. It was GREAT. Smoky delicious pulled pork, tropical cole slaw with papaya and pineapple, sweet potato fries. And the sauces – they make their own. Regular, sweet smoky, and “Carolina style” vinegar. Yes, they called it that. And hoo boy, it was better than any vinegar-based BBQ sauce I EVER had in SC. We asked what was in it, and I am going to try to recreate it. I actually have a number of recipes to find/create that we have really enjoyed here, all listed in my handy little notebook. As we walked back to the hotel. the full moon was high in the sky, looking serene and beautiful over the trees. Tomorrow morning we are getting picked up at 9 to head to the Liberia airport, which is about 60 miles away. We are checked in but still have to pay the departure tax after we get to the airport. Here’s hoping that all is uneventful. These are direct links to blog posts about my travels to Costa Rica. Click to go to the post.